Anyone replaced a rusted wheel on their BSK? Broil King Keg Forum > Broil King Keg, Big Steel Keg and Bubba Keg Grills > Big Steel Keg / Bubba Keg Convection Grill Discussion > Anyone replaced a rusted wheel on their BSK? Anyone out there in BSK land have to replace the base below their BSK due to rusting? 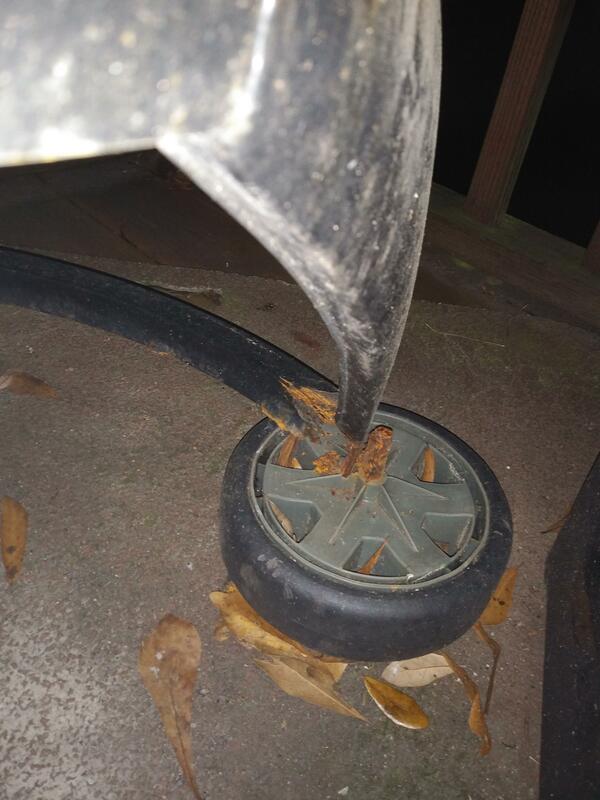 Re: Anyone replaced a rusted wheel on their BSK? I would contact Broil King for warranty replacement. Their customer support has been stellar. Thanks to both of you for replying. Billsfan can I ask if your new base was received under warranty or did you buy it? Since BSK is not on the list of OMC brands which can have warranty work requests submitted though their website, I followed their instructions and emailed a request for replacement of the affected parts to info@omcbbq.com. I'll update when I get a response. FWIW, a picture of the problem. Looks like a warranty claim. Broil King is honoring BSK 10 year warranty due to their purchase of the keg patents. Interested in the response you get. Following the instructions on the omcbbq.com website I emailed info@omcbbq.com and asked about a warranty claim for the BSK base. I received a reply that the base was covered under the 10 year warranty but the wheels were not so I'd have to buy them and also pay a $15 shipping charge. I was given a reference number and told to call their CS line. When I called the next day I spoke to a relatively competent CS rep. She said after much back and forth that neither the base or the wheels were still under warranty. I argued that I was told via email that the base was covered. She put me on hold and apparently talked to her manager then came back and said yes, the base was covered. Yea! However she said the bottom part of the BSK itself was also covered so they were going to send me a new one of those, even though I had not even mentioned this. I'm fine, whatever. So I paid $11 each for two new wheels plus $15 shipping ($37 total) and I'm getting the wheels, a new base to attach them to, and an entirely new bottom part of the BSK itself. At least that is what she told me--I'll be a buyer when I actually lay eyes on all of that. I had a warranty claim in the bottom of mine....took almost 9 months for them to ship it. Yes they replaced it under warranty with the shipping charge. I got a new bottom last year that was rusted out.